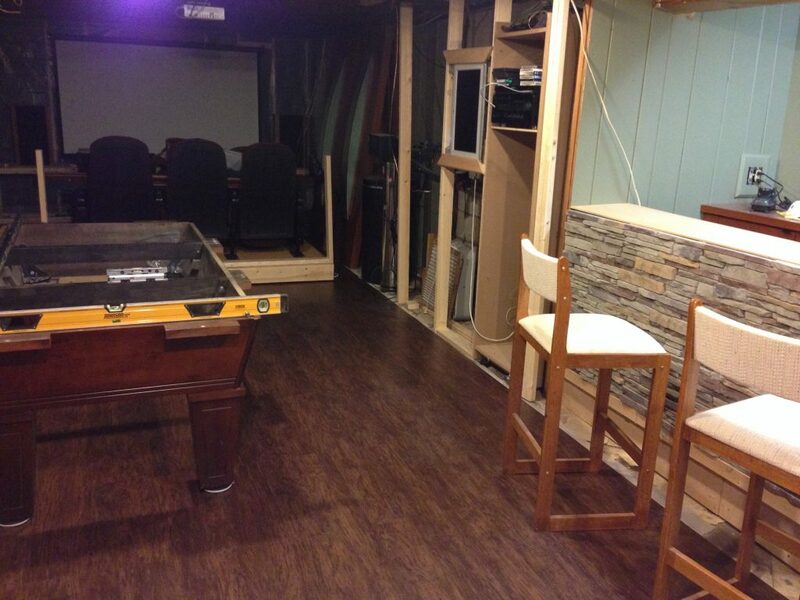 So our neighbors wanted to get rid of their pool table (3 pcs slate table) and we were actually just putting a bar / theater in our basement so it would have been a great addition to our basement remodel project. 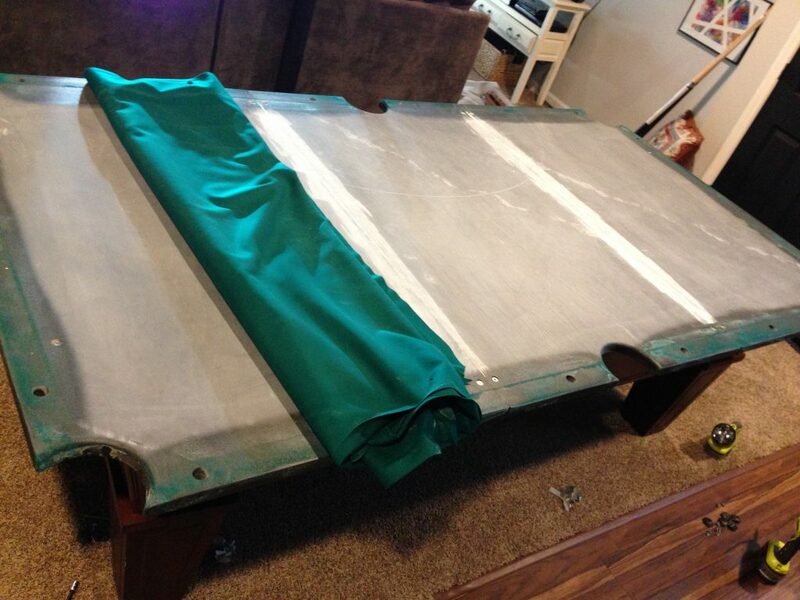 But I was intimidated by the thought of moving and re-felting the table. 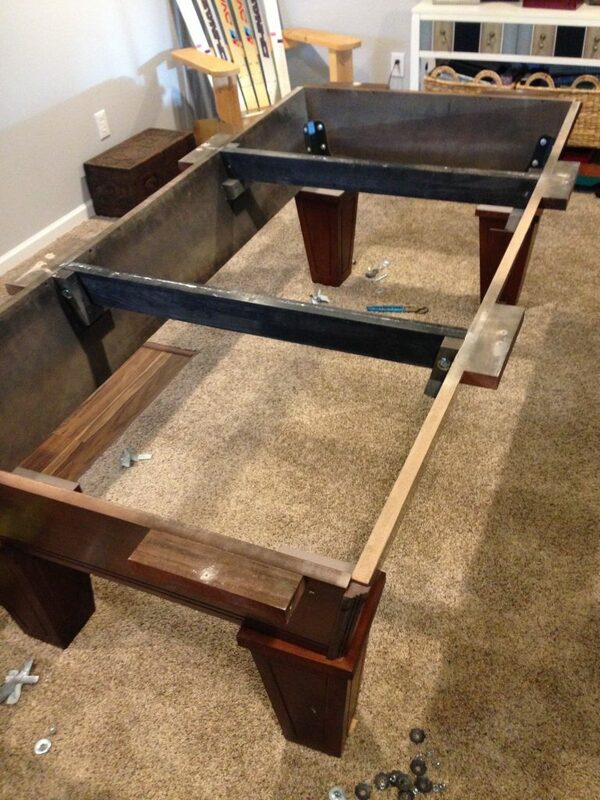 I called a couple of pool table movers locally to see what the cost would be to have them do it. 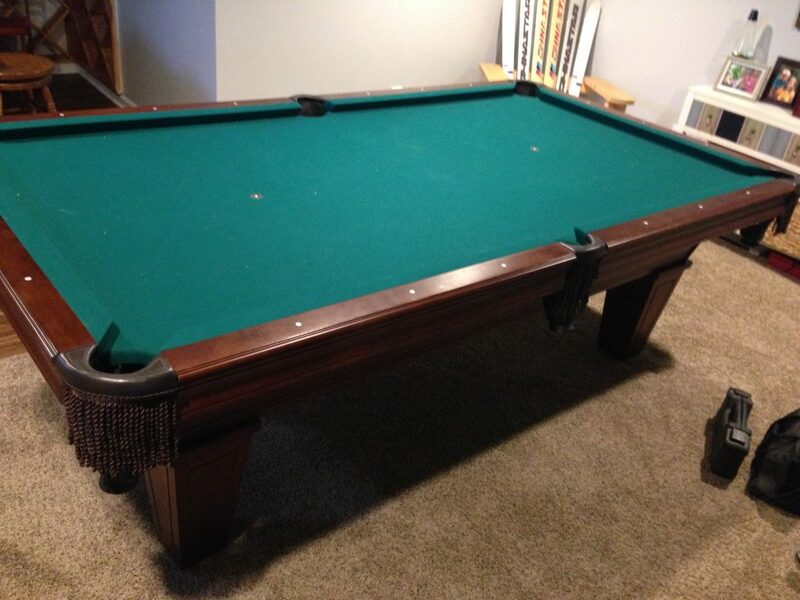 Most wanted about $400 to move the pool table from one house to the next. I wasn’t to excited about paying that kind of $ just to move something that was so close to begin with. 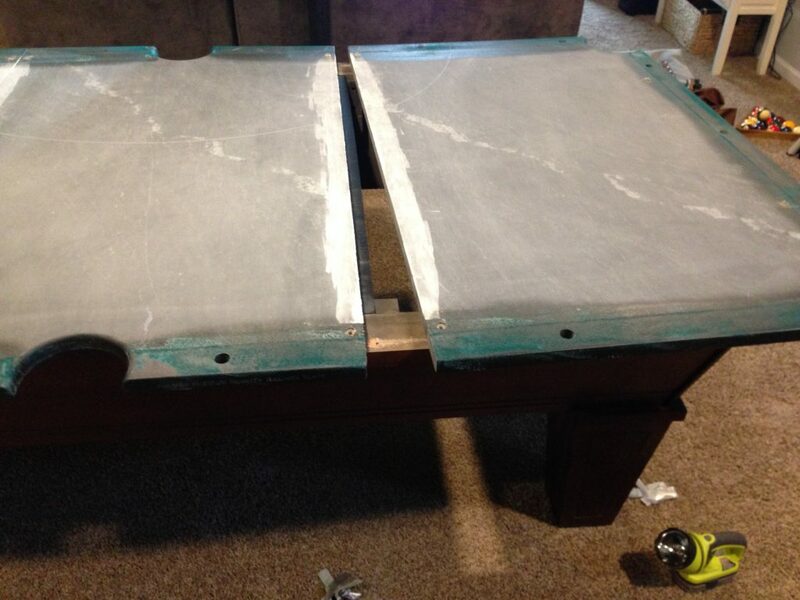 So I hit Youtube and looked for “How To Move a Pool Table”. There were many videos that showed how to do it so I watched a few and felt ready to make the move. 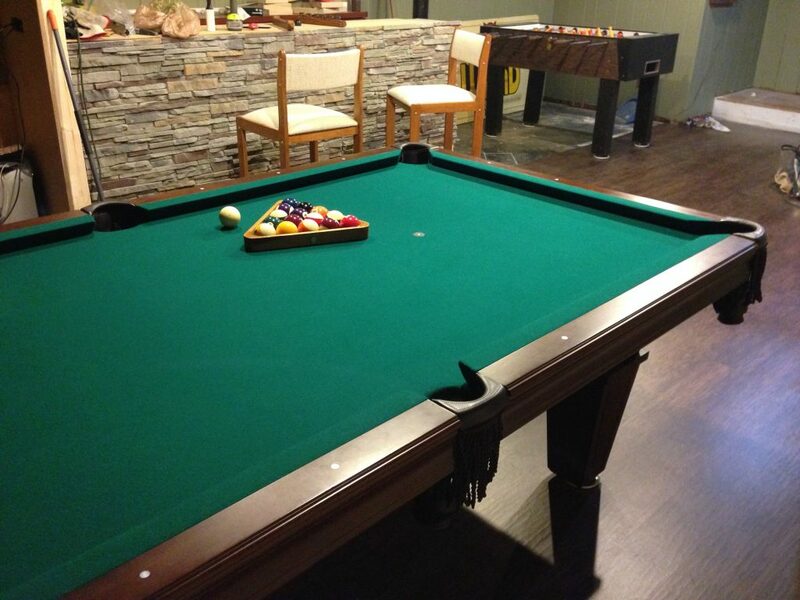 This is the table BEFORE the move. Our neighbors left the door unlocked and went to work so I had all day to get it moved. I started by removing all the bumpers. They just bolt down thru the holes on the edges of the slate. That took about 10 minutes. Very easy. Then it was time to remove the felt. As you can see in the photos, this one was only glued down around the edges with a spray adhesive. So I gently pulled it up and it came right off, no problem at all. 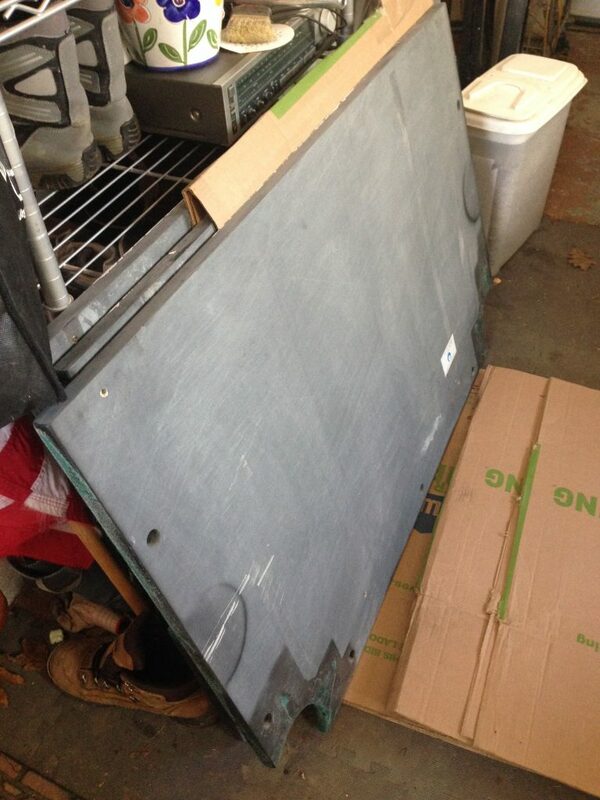 Then I had to separate the pieces of slate. The slate is extremely heavy. 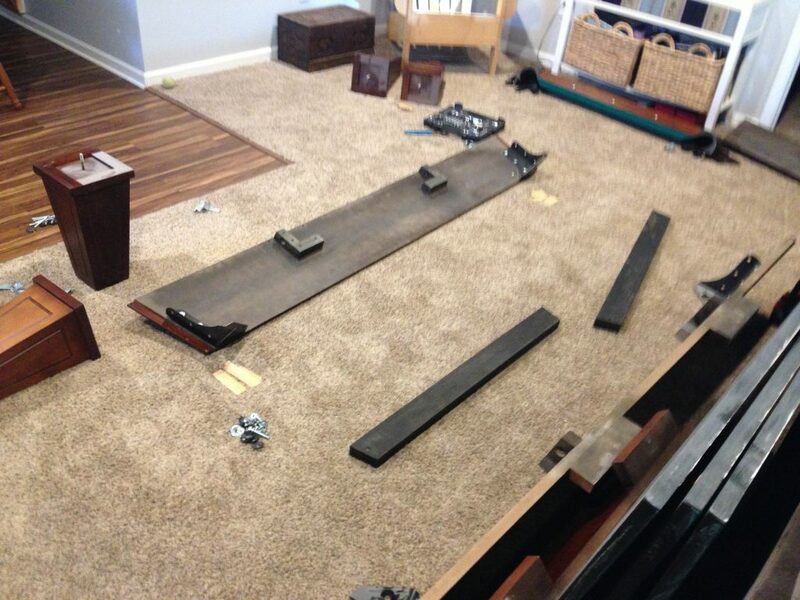 I was able to get each piece off of the table top but needed help getting them out of their basement. 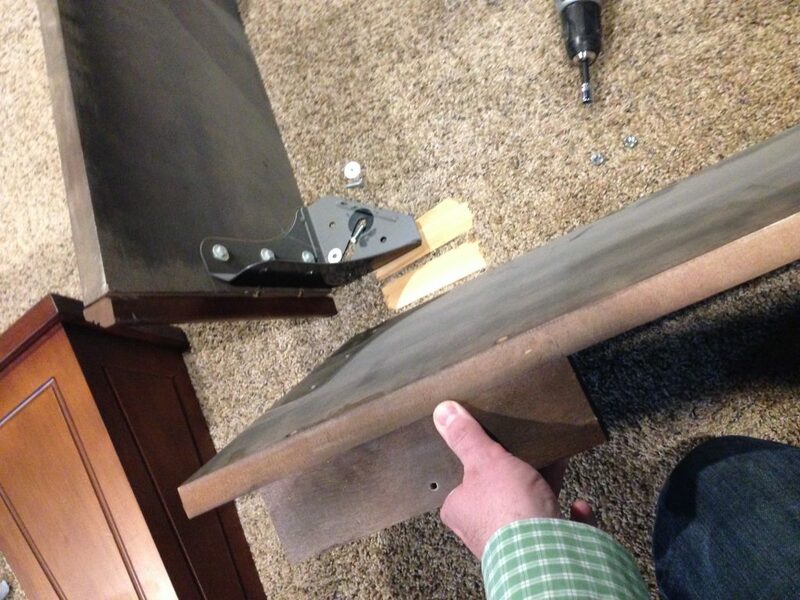 Once the slate was off It was just a matter of disassembling the base structure. I took the sides apart and removed the legs. 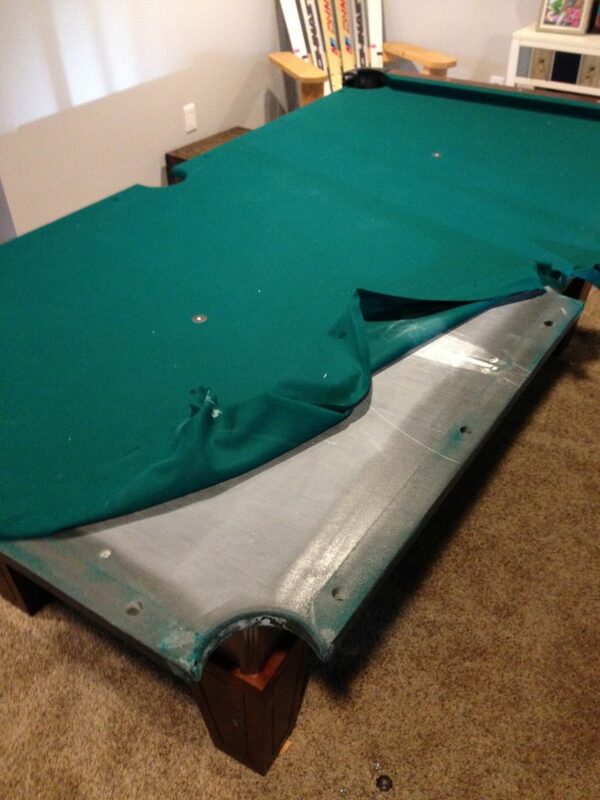 After a few minutes the pool table was completely taken apart. 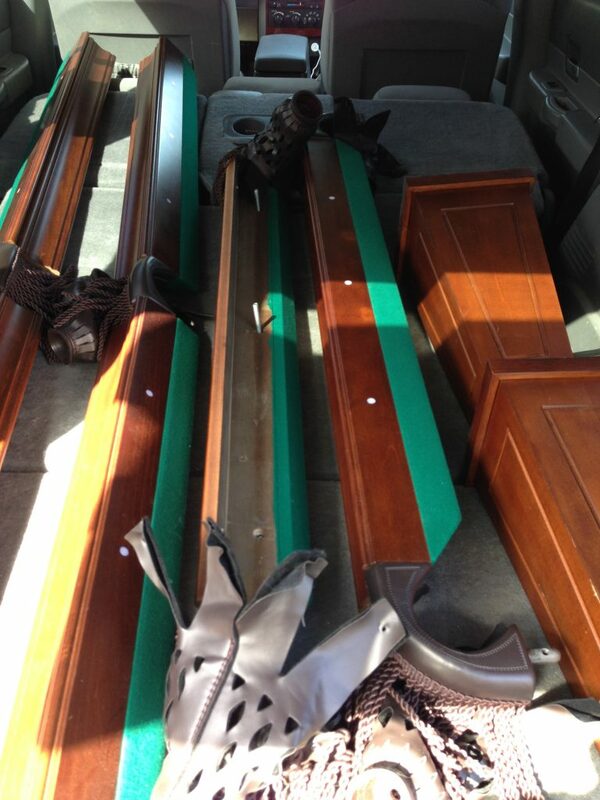 Then I loaded the pool table parts into my SUV for the drive next door. I had the location measured out on the floor with tape so I knew exactly where it would go. 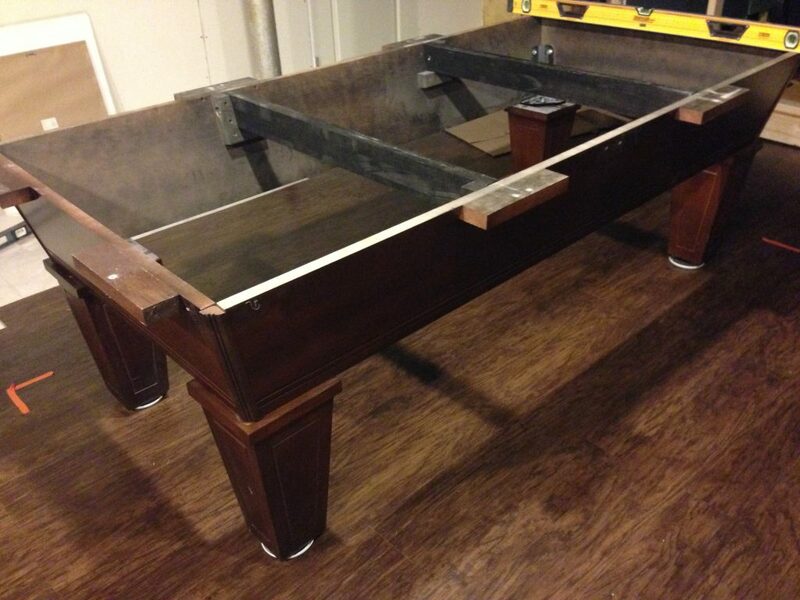 Once it’s together you don’t want to have to move it. I spent a while shimming it up to level. Once the slate was on the table I began to refelt. I started by spreading the felt out and getting it aligned with the pockets. 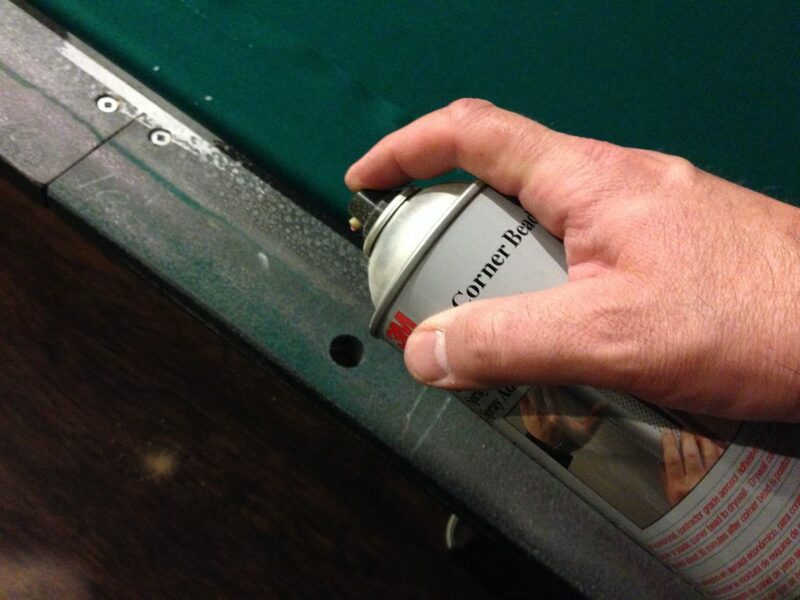 Once it was in the perfect location on the slate, I folded up the edges so I could apply the spray on adhesive. I had some drywall corner bead adhesive so I used that. it worked perfectly. 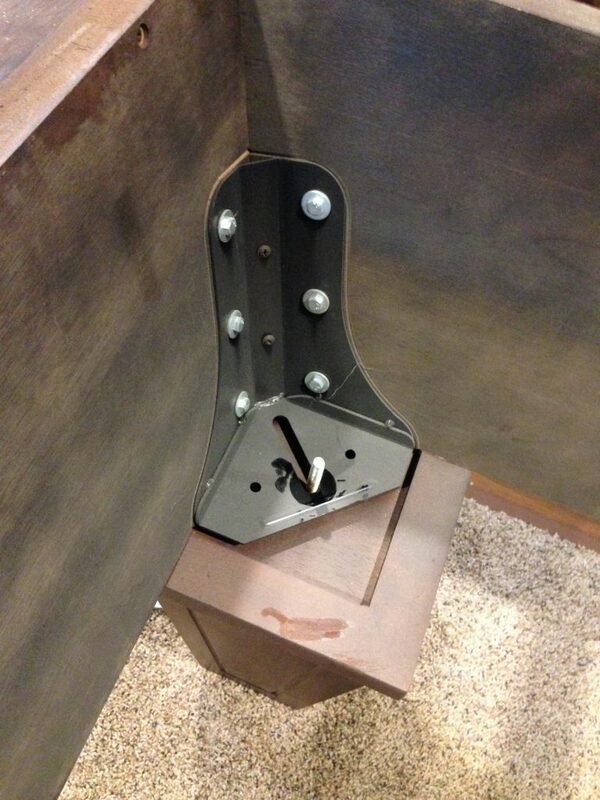 Then just bolt the bumpers back on and screw the pockets on with the wood screws so the balls stay in the pockets. Thats it. Not hard at all.